Jordan Henderson showed yet again why he’s our captain in a Man of the Match performance in yesterday’s huge win over Chelsea at Anfield. Picking up an assist for Sadio Mané’s headed opener and an indefatigable nuisance in midfield, Hendo was everywhere against Maurizio Sarri’s defeated side. 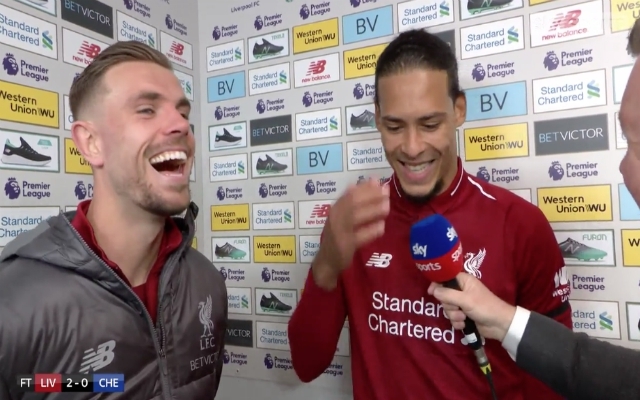 Together with Virgil van Dijk, in his post-match interview with Sky Sports, Henderson explained what the Jürgen Klopp and the Reds need to do in the coming weeks. “Like said when the manager first came in, it was do everything you can in the 90 minutes and don’t stop until the final whistle really, no matter what state the game’s in, you keep going and we stick together until the end and we’ve been doing that for a long time now. “So we’ve got to keep doing that, it’s important even at 0-0 to keep believing we know we can create chances and score goals and we know we can keep clean sheets and defend as well. “So it’s keeping the belief staying positive and that’s what we’ve been doing,” the captain concluded. The Reds dominated the first half and there were a range of chances for us, but we just couldn’t find a way to get the ball in the net. But this Liverpool side are a completely different beast – calm and accomplished when the score is stuck at 0-0 – we always seem to find a way to stick the ball in the back of the net. Part of our recent success as been the captain’s positional tweaking. Hendo was classically humble when delivering his reply to questions about his change in position. “Yeah, I’ve obviously spoken about the last couple of weeks as I’ve moved little bit further forward, which I’m enjoying and doing the best for the team and contributing, thats not only in the attacking third but defensively as well. “So, yeah, just got to keep doing that and the team’s been magnificent so we need to keep it going right to the very end,” he added. The 28-year-old said that the next few weeks are all about keeping our focus sharp and taking each game as it comes. “We’ve got to just concentrate on ourselves like we have been all season, keep working hard, doing the work on the training pitch and then doing the business on the Saturday or mid-week in the Champions League. “So, focus is on the next game, recover well, another big game coming and we’ve got a few of them coming up in the next few weeks. We’re trying to enjoy it too, but with so much on the line and Manchester City needing to drop points we’re in for a nail-biting run-in. However, we can take solace in the fact our final four matches against Cardiff, Huddersfield, Newcastle, and Wolves are all very much winnable games.